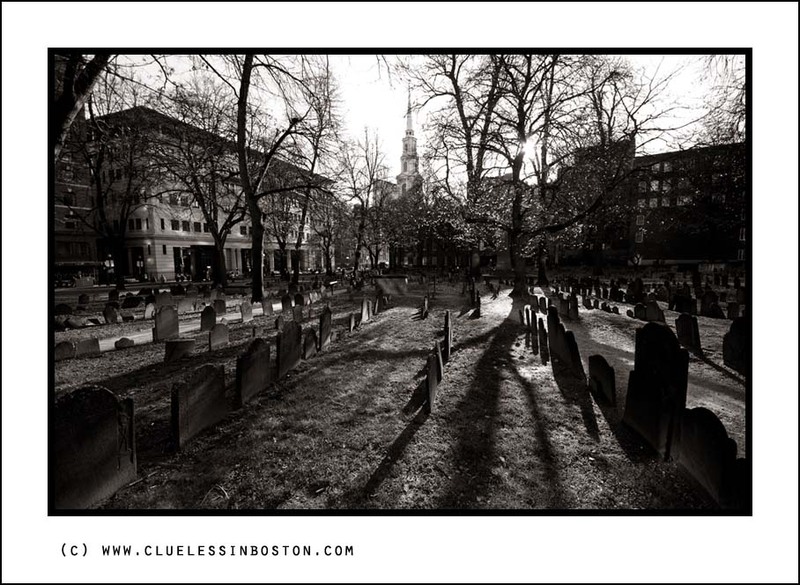 View from the Granary Burial Ground on Tremont Street. Church in the background is the Park Street Church. You can view other b&w photos at the Monochrome Weekly, hosted by Aileni. The shadows and contrast are perfect! Great photo. The shadows certainly 'make' this shot of early morning or late evening. Which? Impressive shot, Clueless! Well composed and great contrast! Fantastic monochrome! Sparkling black and whites in perfect balance! Like it so much my friend, the shadows was stunning beautiful. The shadows born from the winter sun give a great depth to the picture . And with that special light, what should be a sad picture becomes a nostalgic but luminous shot.. I like the lines of the headstones, and then the church spire behind them. Maybe it's because it's in a city, but the cemetery looks tidier than many of those around here. Me too like the lines of the heastones. And the shadows and the light coming through the trees. Perfect. I love the perspective on this. You keep us a bit at a distance and yet there's a certain vertigo pulling us down into the image. your shots are so great, why don't you enlarge them! Looks like it could have been taken anytime in the last 100 years. This is stunning with fantastic shadows. You do know how to pick your lighting. Your photo works at all levels. This one is a real keeper. Thanks for dropping by for a Subway ride. I love the pattern that the shadows create. And the sun light coming through the trees. You did an great technical job! Very nice perspective with this fleeing shadows! The light and composition are very nice in this strong b/w shot! This is how I remember Boston. This is also how I imagine it to have been one hundred years ago. Great photo. Looking at your pictures really makes me miss Boston. I have to get back for a visit soon.